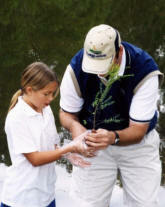 Partner with us to do something good for the environment. Choose from a variety of fun and engaging projects in five areas: wildlife, water, outreach and education, eco-efficiency, and community. Materials tailored for Schools and Youth Organizations are available. Tailored to the unique environmental opportunities and issues of golf courses, this program helps golf courses to protect and showcase the nature of the game. Communities seeking assistance with sustainability planning get the help they need to build consensus and go beyond talking about sustainability to taking action to attain it. Three different tracks are offered: Public Sector Track for local governments; Private Sector Track for large-scale developments; The University Track for educational communities.